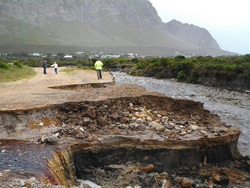 One person died and another was reported missing in the recent flooding in the Western Cape. 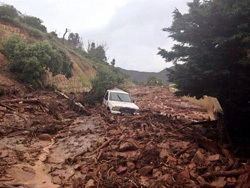 The flooding caused numerous rockfalls, mudslides and landslides along mountainous areas. Power outages were also reported in several areas. 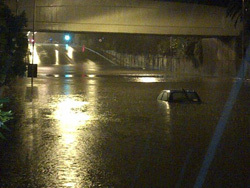 Over 18 000 people were affected by the floods this past weekend and threats of more wet weather to come. An approximate R3m has been spent on providing social relief. In the Somerset West/ Strand area the famous Lourens River had burst its banks and washed away roads, houses and Vergelegen Medi Clinic in Somerset West. Nobody was injured and 129 patients were taken to safety. 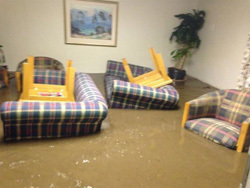 In Franschhoek the periodical court and the police station were flooded. All pending matters were moved to the Paarl Magistrate’s Court. Police spokesman Captain FC van Wyk said on Saturday that, following the flooding of the Franschhoek Police Station, prisoners were moved to a nearby police station. Other Affected areas were Delft, Faure, Fish Hoek, Gugulethu, Hout Bay, Khayelitsha, Kraaifontein, Kuils River, Sir Lowry’s Pass and Valhalla Park.